It's hard to say exactly when I first noticed an itchy spot on the back of my neck. It was probably itchy for around six to nine months at a guess before the skin became so fragile it would tear off under relatively light scratching or rubbing pressure. The area then deteriorated into an ulcerous, weeping, full skin thickness depression the size of a 20-cent piece. That is when I sought medical advice from my GP. My GP suspected basal cell carcinoma, but because of the look of the ulcer she also suspected either a fungal or bacterial infection as alternative possibilities. She prescribed an anti fungal antiseptic ointment "Kenacomb" and contacted a skin specialist who couldn't fit me in until six weeks later. I was told to apply the anti fungal medication until the specialist could see me. Previously I had applied DHAA-Vitamin C Serum to my 89 year old Mother who had a serious bacterial infection from a toenail fungus. I was truly amazed how abruptly the DHAA Vitamin C Serum brought her infection to a halt in less than 24 hours. This was an antibiotic resistant strain as two courses of antibiotics had failed to control it. I figured that if my issue were either fungal or bacterial the DHAA Vitamin C serum would fix it rapidly. I did not use any of the Kenacomb ointment. I applied two drops of undiluted 17% Ascorbic Acid and Dehydroascorbic Acid in Glycerine serum to the ulcer twice daily. The open ulcer was quickly cleaned of debris by the serum, soothed, began healing and stopped weeping. Within a week a very fine skin developed. The first photo below was taken around four weeks after I started with the DHAA serum. It shows the ulcerated portion, which had initially extended to the very edges of the lesion half healed and the original full skin thickness depth of the ulcer much reduced. The healed section had baggy and ruffled skin texture very similar to basal cell carcinomas I had previously. At six weeks the wound had completely closed. 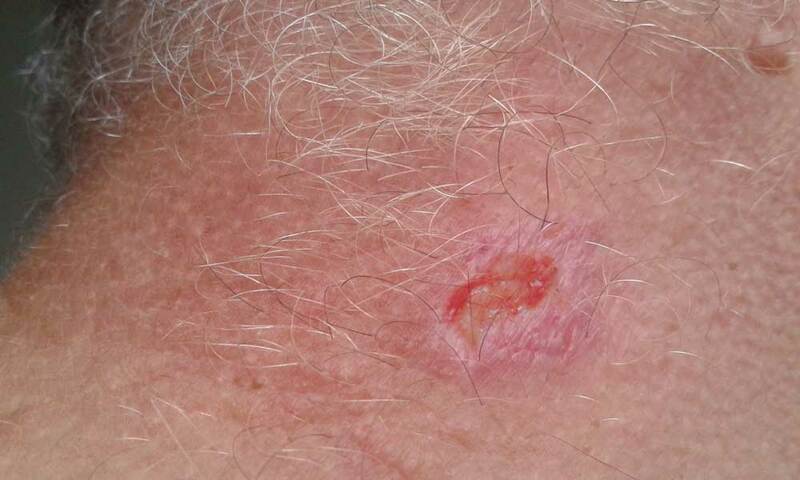 The photo below shows the affected area a week or so before the appointment with the skin surgeon. 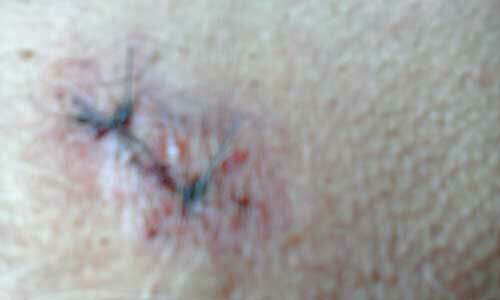 During my appointment the specialist took two 6mm diameter full thickness punch biopsies and stitched up the wounds. One biopsy was taken from the middle of the lesion the second was taken from the border, half in half out. It took almost a week to get the biopsy results and I continued applying the serum until my next appointment. Apologies for the poor quality of the photo, it was taken on my phone. At the next meeting with the specialist there was some confusion over the biopsy results, while it was definitely a basal cell carcinoma the debate was around the classification. It was either a full thickness BCC or a superficial basal cell carcinoma. The former would require surgery; the latter at this size is often treated with Aldura cream. My cells from the biopsy appeared to have features of both types. Eventually the diagnosis settled on superficial BCC and the Aldura cream was prescribed. He told me to use the cream and return for a checkup in six weeks. I picked up the cream and decided to check it out on the Internet before using it. After reading and seeing some real horror stories I decided I would continue with the DHAA Vitamin C Serum, which had already, and continued, to work so well. If it stopped working I intended to use the Aldura cream as a last resort. Six weeks rolled by and I returned for the check-up at the specialist’s office. The biopsy wound healing and resolution of the basal cell carcinoma was so complete by this time no scars were visible, not even the biopsy scars remained! I was already sure my BCC had been completely cured. The specialist found the healing of the basal cell carcinoma was so complete after twelve weeks of DHAA Vitamin C Serum treatment he had to refer to his medical photos to find where it was and where he had performed the biopsy surgery only six weeks earlier. All that remained were two tiny puckers where the stitches had pinched the skin to hold the biopsy wound closed. He commented that the skin in the treated area looked in better condition than the rest of the skin on my neck and mentioned that had I used the Aldura cream I would be only be half way through my treatment cycle. I informed the specialist of my alternative treatment regime and he concluded that the basal cell carcinoma had "self resolved" but suggested we wait for three months to confirm complete remission. That was 10 months ago and I am still all clear and the skin still looks great in the treated area. I have had four previous occurrences of basal cell carcinoma, three small ones had been successfully frozen off with liquid nitrogen, and the fourth had required a full thickness surgical removal and multiple stitches to close the wound. Had it been any larger a skin graft would have been required. I suspect that had the biopsy on the latest basal cell carcinoma been taken before I applied the DHAA serum the diagnosis would have been full thickness basal cell carcinoma as the lesion was well over halfway healed and had become very shallow before the biopsy was taken. The aberrant cells were obviously being killed off and replaced by healthy cells at a very fast rate. Since the treatment I have treated two new similarly textured lesions at the size of a match head. Both resolved in around five days to 10 days. I have also treated a wider area of sun-damaged skin in the hope that aberrant pre-cancerous cells will be killed off as a preventative measure. In my experience the smaller the area the easier it is to remove. As a side effect sun spots and moles also fell off during treatment with the DHAA Serum both inside and outside the treated area. I consider the DHAA Vitamin C Serum an excellent alternative to existing basal cell carcinoma treatments as it heals without destruction or removal of tissue. I think its real value is probably as a preventative for people who have had a lot of sun exposure and may have undetectable small lesions or pre-cancerous cells. I believe a three week treatment of exposed areas would most likely destroy all such cells. 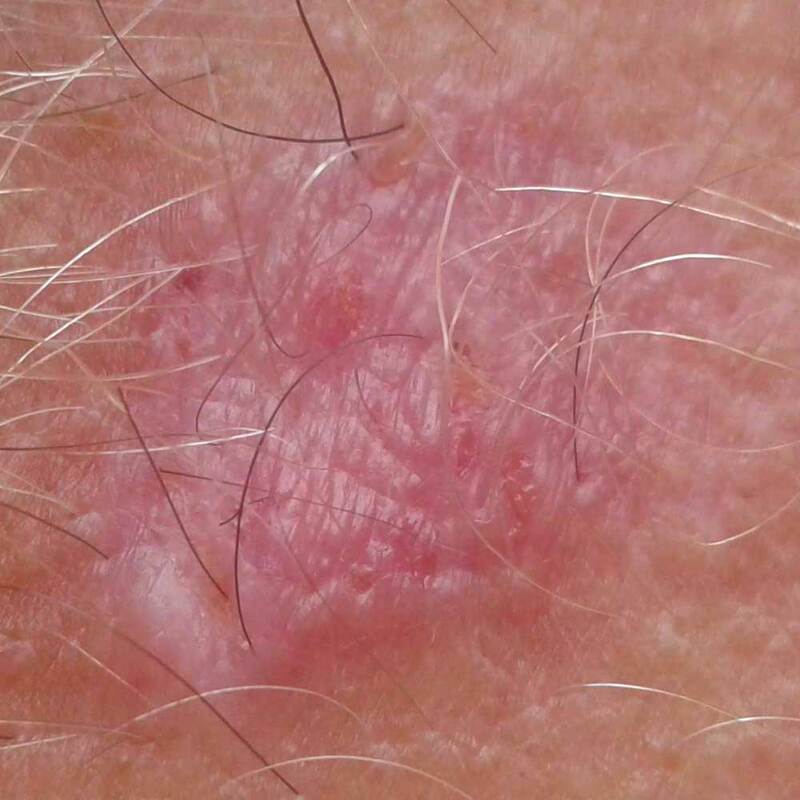 Basal Cell Carcinomas account for 75% of all skin cancers in New Zealand with 67,000 new cases diagnosed annually. While basal cell carcinoma is less serious than other forms of skin cancer it still needs to be treated promptly as major surgery can be required if it is allowed to spread (see videos at bottom of linked page). 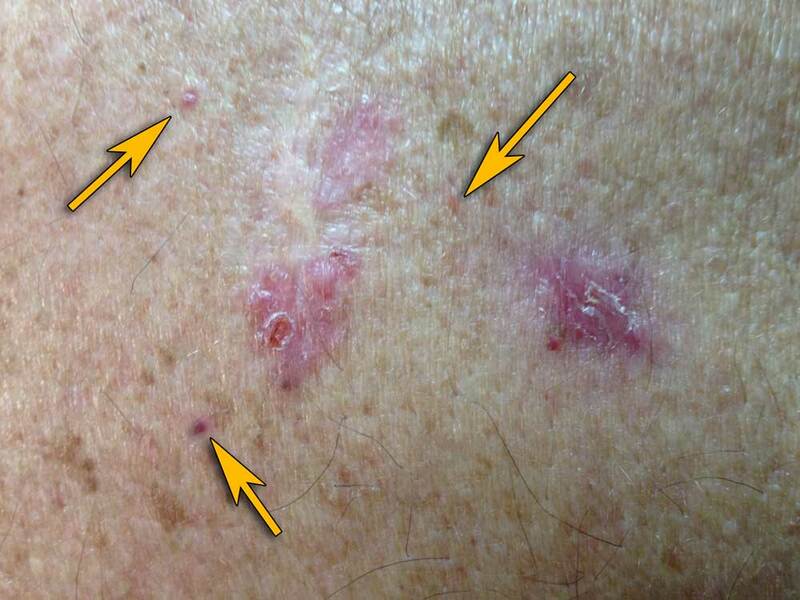 Around 100 New Zealanders per year die from basal Cell Carcinoma while around 250 die from from melanoma skin cancers. The annual cost of treatment of non-melanoma skin cancers is over 60 million dollars per annum. Volunteer is a 71 year old surfing fanatic who has spent untold hours basking in direct and sea reflected sunlight in New Zealand, the Ultraviolet Light - Ozone Poor Capital of the world. He has also worked around volatile chemicals for years. The damage to his skin is considerable and he has battled multiple Basal Cell Carcinomas for over 30 years. He reports that while most treatments have had some success, only his first surgery around thirty years ago completely resolved a sizable basal cell carcinoma in one session. The subject has had multiple surgeries, reactive cream sessions and multiple lesions have been frozen or burnt off over the last 30 years. More recently he has resorted to black salve, which, while dangerous, seems effective at the time of treatment but the lesions still return. In the first photo the extent of the damage can be seen. 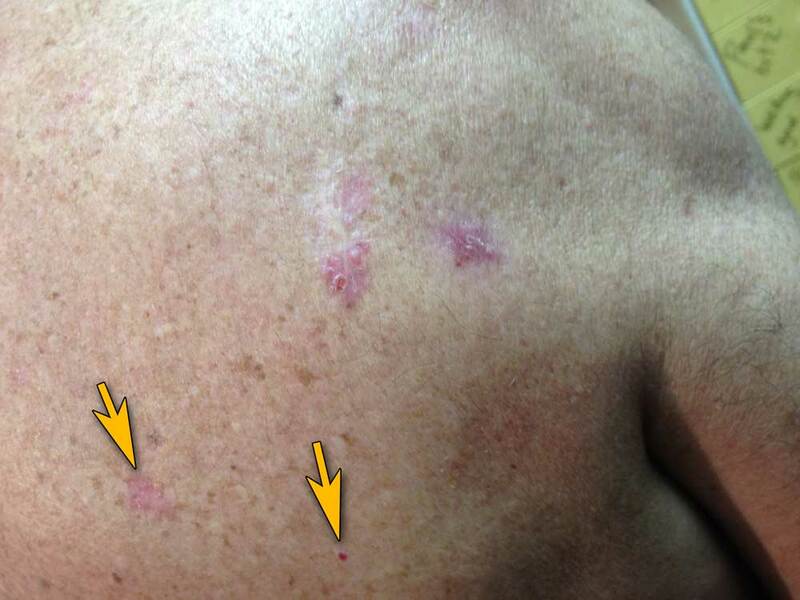 The abnormal white skin tissue between the central two larger lesions is representative of the threads reported in the case above. It also looks like a connection exists between the right hand lesion and the connected pair as pinkish discoloration spots occur between the point on the right hand lesion and the top lesion of the joined pair. It will be interesting to see if the DHAA serum reveals a connection that cannot be seen with the naked eye. In the mid back a new cluster appears to be forming. 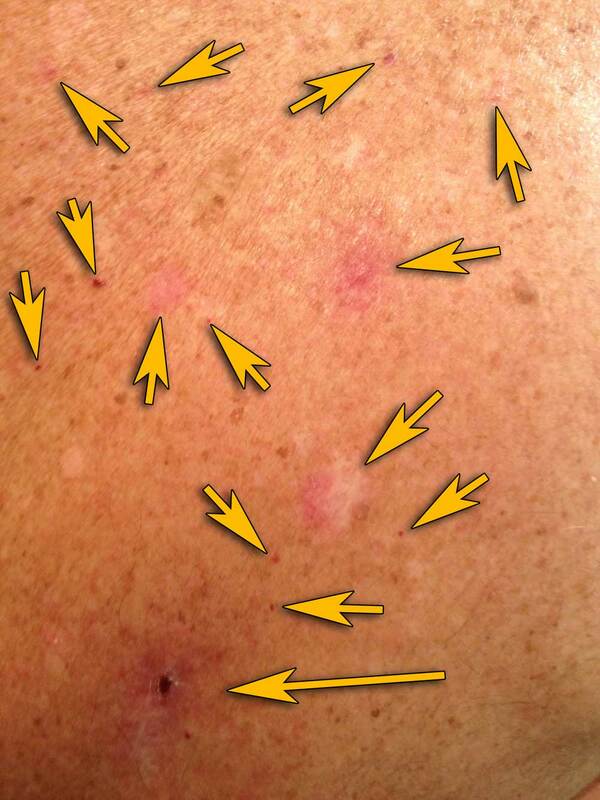 The lower arrow shows a new BCC developing at the end of a surgical scar where a previous lesion was removed. This has been a problematic area and several treatment scars are noticeable. 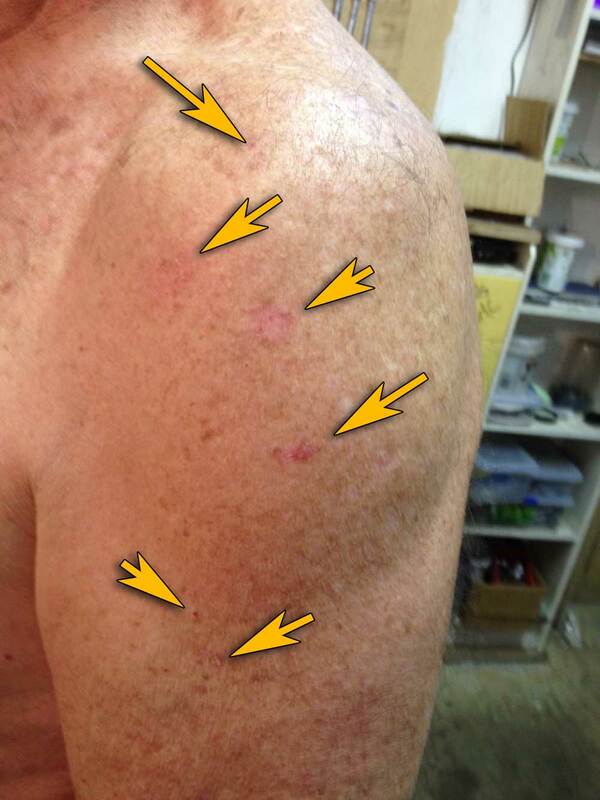 The left shoulder is also developing a cluster. 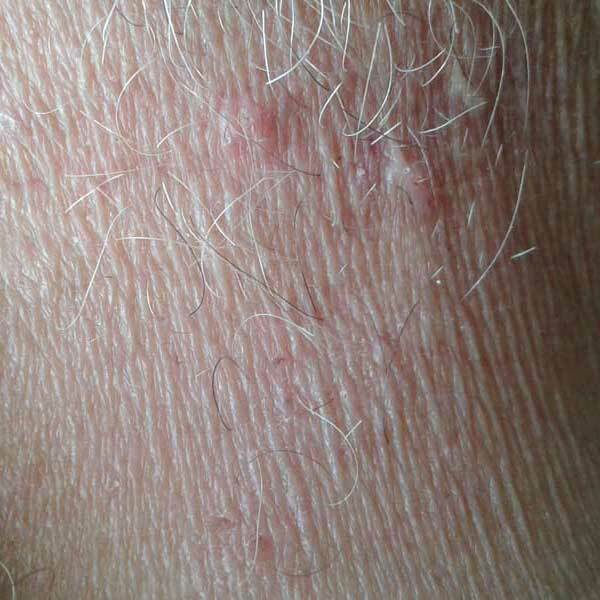 The rest of the exposed skin areas have intermittent small lesions more widely spaced apart. Our main hope for the treatment is to prevent the small new basal cell carcinomas from becoming full lesions. The larger more established areas of BCC are liable to be very resilient and difficult to treat as they have survived all medical interventions, prescribed creams and black salve. Time will tell. DHAA Vitamin C Serum treatment started four days ago and we will update this page as new information comes to hand.